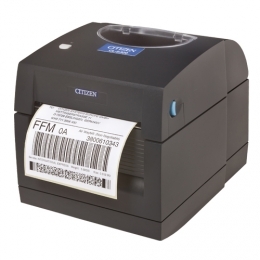 With the CL-S300 desktop label printer, Citizen releases the typical starter device affordable, reliable, interesting specifications. It has been conceived for on-demand label printing in goods shipping, item labelling in retail and document marking in the healthcare sector - its compact housing allows for versatile use. User-friendliness was one of Citizens main aspects during the development. Integration could hardly be easier, thanks to its USB 2.0 connector, while drivers for Windows operating systems make the CL-S300 a handy out-of-the-box printer. The special Graphical Device Interface GDI enables printing out of any Windows application. The maximum print speed of 102 mm per second supports fast task processing. Its standard resolution of 203 dpi 8 dots/mm ensures for sharp, very high-quality printouts. Citizens Hi-Open mechanics facilitates handling the CL-S300 even for unpractised users. Maintenance and replacing media become casual day-to-day routine, ensuring smooth operation.